Our school is located on a beach moderately windy, the wind is blowing parallel to the shore: it comes out then the beam. It 'a spot ideal side security: shallow water, sandy bottom, long beach. In the bay where the school is located, thanks to the low end, you can safely walk back. It 'a logistical situation privileged but certainly not rely only on this: in case of need, Our staff is always ready to come out with appropriate means to recover people in distress. 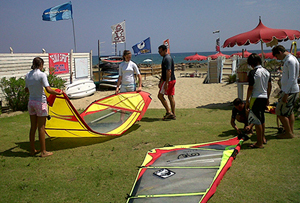 Our collective groups consist of a maximum of 3 people in the beginners courses, and a maximum of 2 for the advanced. The whole program of successive levels: theory, knowledge of the winds, knowledge of materials, starting to walk sideways, turn based, safety rules and basic nautical knots. Evolution of Basic improvement in which all points of sail, tacking and jibing fast base. 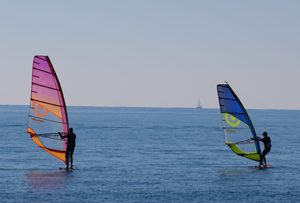 jibe, starting from the beach, use of the harness and straps. 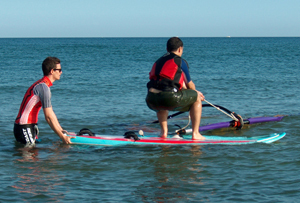 Suitable for beginners to gain confidence in water and learn the knowledge of the equipment. Rudiments of navigation and first aid at sea with support pesonal specific. Fast program of basic levels: theory, knowledge of the winds, knowledge of materials, starting to pace through, turning basic safety rules. Central hours / afternoon with little wind. 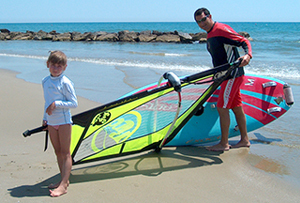 Beginners level for children: the same program but with the basic equipment tailored for children and teens. From 5 to 12 years. Low wind conditions. 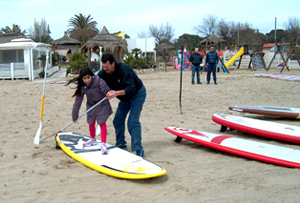 Initiation to the functioning of aquatic sports equipment for children. From 4 to 10 years. 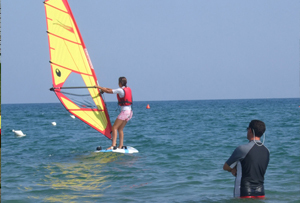 In order to bring the kids to all aquatic disciplines (sailing, windsurfing, kayaking, body boarding. (Minimum 4 participants). Central hours, medium wave. Theory, knowledge of SUP board, knowledge of materials, simulation at the beach, starting with paddle pace, turning basic safety rules. Central hours, medium wave. 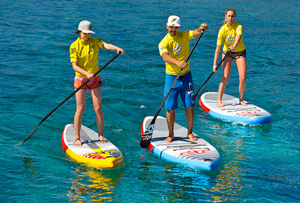 Sports paddling, paddling use on the wave, fast start, fast tack, safety rules. Central hours, medium wave. Theory, knowledge of the kayak, knowledge of materials, starting with gait paddle, turn based, simulation tipping lifts on board, safety rules.